The attackman's responsibility is to score goals. The attackman generally restricts his play to the offensive end of the field. A good attackman demonstrates excellent stick work with both hands and has quick feet to maneuver around the goal. Each team should have three attackmen on the field during play. 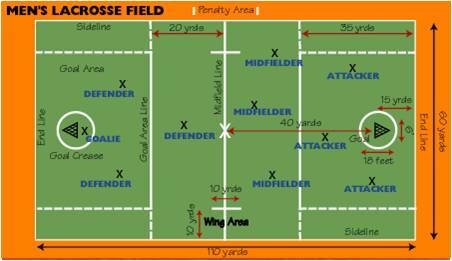 The midfielder's responsibility is to cover the entire field, playing both offense and defense. The midfielder is a key to the transition game, and is often called upon to clear the ball from defense to offense. A good midfielder demonstrates good stick work including throwing, catching and scooping. Speed and stamina are essential. Each team should have three midfielders on the field. The defenseman's responsibility is to defend the goal. The defenseman generally restricts his play to the defensive end of the field. A good defenseman should be able to react quickly in game situations. Agility and aggressiveness are necessary, but great stick work is not essential to be effective. Each team should have three defensemen on the field. The goalie's responsibility is to protect the goal and stop the opposing team from scoring. A good goalie also leads the defense by reading the situation and directing the defensemen to react. A good goalie should have excellent hand/eye coordination and a strong voice. Quickness, agility, confidence and the ability to concentrate are also essential. Each team has one goalie in the goal during play.